REUTERS/Alexander ZemlianichenkoRussian President Vladimir Putin smiles during a meeting with German Foreign Minister Frank-Walter Steinmeier (not pictured) in the Kremlin in Moscow December 18, 2007. This year, Putin annexed the multi-ethnic peninsula Crimea, engineered a war in Ukraine, and signed off on the world’s largest construction project, a $US70 billion gas pipeline deal with China. Furthering geopolitical uncertainty, Putin has made casual references to Russia’s approximately 8,484 nuclear warheads in a move that many analysts speculate as a clear challenge to NATO member states. The Russian air force has been particularly active since 2013, carrying out simulated attacks on both Stockholm and North America. In the end of October, NATO jets intercepted 26 Russian aircraft in two days — an unusual level of Russian activity. Putin hasn’t been shy about throwing his power around this year, engaging in high-risk tactical and strategic gambits and using Russia’s natural gas and oil wealth to lessen the political and economic consequences of his aggressive decision-making. The following map depicts the larger confrontation between Russia and NATO and the possible return to Cold War power dynamics in Europe — something Putin’s helped usher in over the past year. 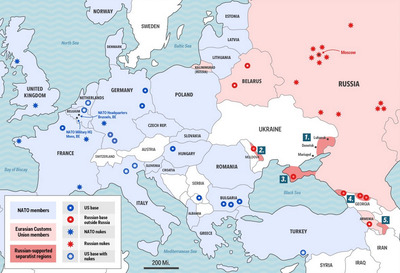 Mike Nudelman/Business InsiderA map of the Russia-NATO confrontation. Russia has already declined attendance at the bi-annual 2016 nuclear security summit held in Chicago, according to a Reuters report. Aside from a focus on hard power, Putin has given his rule an increasingly anti-Western ideological bent. In October, Putin gave one of the most anti-American speeches of his career in which he accused the US of a double standard of the world order. Throughout the entirety of the Ukraine crisis, Putin has accused the US and other western powers of organising a coup that put alleged anti-Russian “fascists” in control of the government in Kiev. Putin has charged the US with having a double standard over its intervention against Serbia in support of Kosovo’s ethnic Albanians in the 1990s. Putin has decried that if the US can intervene in the world as it sees fit, then Russia can also do as it pleases. 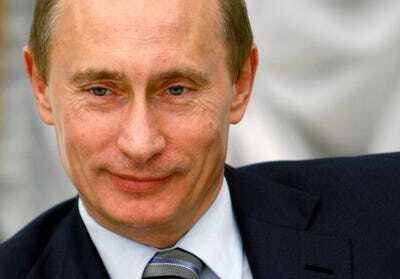 Forbes ranked President Barack Obama as the second most powerful person in the world, just behind Putin. Third place went to Chinese President Xi Jinping, fourth was Pope Francis, and German Chancellor Angela Merkel was fifth. There are 12 new figures on the list including Indian Prime Minister Narendra Modi (15th) and ISIS leader Abu Bakr al-Baghdadi (54th).